Another favourite activity in Vietnam were the spa visits for massage, facials, pedicures and manicures. Thanks to Rachel in our tour group, who did the research and initial test (after which she gave the thumbs up,) a number of us made appointments at *Palmarosa spa, located conveniently around the corner from our Hotel. In fact I loved it so much I went back a second time. Palmarosa is an upmarket day spa and is adjacent to Hoi An’s old town. They offer all types of pampering including hot stone massage, collagen facials and mud and salt body scrubs. The spa advertises as using 100% natural ingredients in all of its facials and body treatments. When it came time to choosing my treatment, I felt like another massage (the last foot and leg massage in Hanoi seemed like eons ago) and Anna decided she wanted the same. After soaking our feet in a heavenly smelling bowls of herbs, we were escorted up the steep winding staircase into a private bathroom where we changed into bathrobes. A few in our tour group took advantage of this spa in its convenient location and noting the number of other tourists in the lounge area, I’d say word had spread about *Palmarosa. Location: 90 Ba Trieu Street, Hoi An. 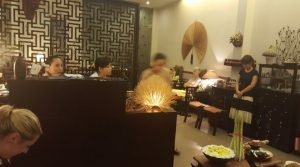 I don’t want to sound like a person who is after a bargain, but massages in Vietnam are incredibly “cheap.” And after our day’s of pounding the Vietnam pavements as a tourist, it was something I indulged in and enjoyed immensely. 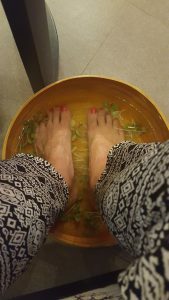 From the feet and leg massages in Hanoi, to the pampering in Spa Palmarosa in Hoi An, to the indulgent spa treatment at my hotel’s day spa in Ho Chi Minh city before boarding the plane later that night – all were amazing. Although the cupping experience at the Nguyen Shack on the Mekong Delta left me battle scarred for a week or two. Said to release the negative energy. My body must have been carrying it’s fair share! 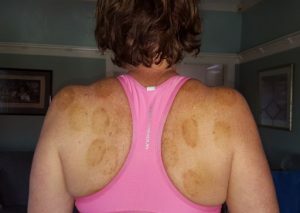 A week later still with the reminder from my “cupping” massage! *Note this is not a sponsored post – just a review by a happy customer. 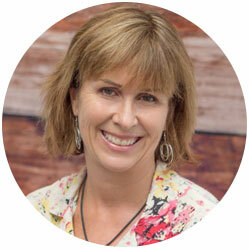 All treatments including those at Palmarosa (http site)were as a fully paying customer. No discounts or freebies were given! I will not accept responsibility for any unfavourable experiences from this review.